I am passionate about toys that inspire my children’s imagination. I remember the time that I bought a really expensive battery operated present for my children, now ages 3, 4 and 5 and they tossed it aside to leap into the box that it came in. They played with that box for hours as their new toy collected dust in the corner. After scratching my head and pouting for a few minutes, I made the decision that from then on I would encourage my children to express their creativity through imaginative play. Imagination Box Co. has mastered the concept of toys that are fun, creative and allow the imagination run free. Imagination Box Co. has an amazing selection of eco-friendly toy playhouses that are proudly made in the U.S. and are 100% recyclable. I was even able to compost the packaging that our Castle Tower was delivered in. I have two boys and a girl so the Castle Tower is perfect….my daughter is the noble princess and my eldest son is the knight while my youngest son plays the scary dragon. 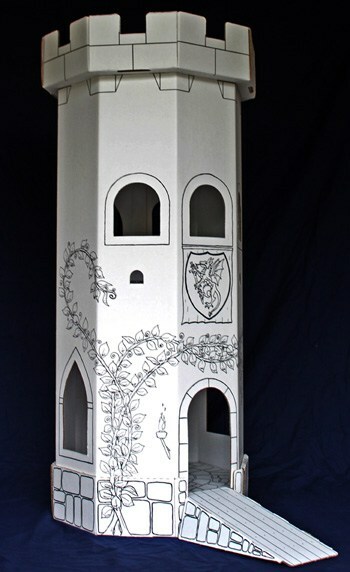 The Castle Tower is very sturdy, has three play levels and comes with a set of watercolors so that your children can customize their own personal creation. Since my kids are younger they easily used crayons and markers along with the watercolors and really had fun creating their Castle Tower. The Castle Tower even comes with six shields that can be personalized for more fun. I appreciated that it only took approximately five minutes to set it up and it kept my three little ones occupied for over 90 minutes (no easy feat for a 3, 4 and 5 year old) while they colored it. I was very surprised with the attention they paid to the details and I enjoyed watching their “masterpiece” come to life. Despite the colors occasionally going out of the lines….they declared it “perfect” with a big smile when they were finally done. Then it was time to play and that they did…..there were princesses and knights chasing dragons and horses and dolls coming to life to rescue the princess and knight after they were thrown in the moat with the man eating crocodiles. 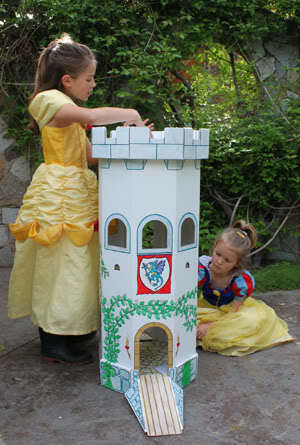 Imagination Box Co. has the Castle Tower available for only $39.00 but it is currently on sale for 20% off-$31.20 is a true bargain for this fantastic toy playhouse. 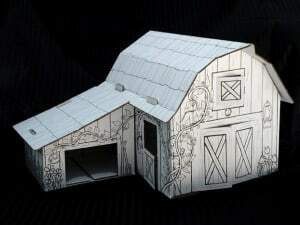 There are other really neat playhouses available at Imagination Box Co. including a Paintable Play Barn for all of the toy farm animals. There is even a Create Your Own option….a steal at only $15.00 (on sale for $12.00). Imagination Box Co. is the proud winner of the Dr. Toy Best Green Product. I highly recommend this as a holiday gift idea for any child who is creative and loves to use their imagination. It is sure to be played with for hours…..
To purchase any of these or to check out all of the line of eco-friendly cardboard playhouses please visit Imagination Box Co.